Renovating a kitchen can be stressful and confusing! 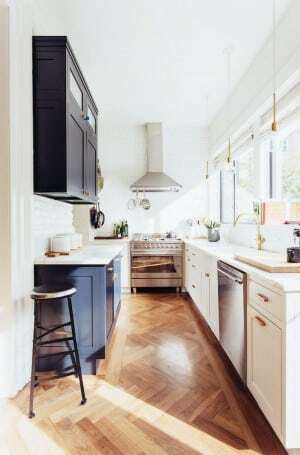 To help you make the right choice, we’ve highlighted some of the pros and cons of a few different types of kitchen countertops. Quartz is virtually maintenance-free as it is a non-porous material. Natural quartz and resin with added colour are combined under pressure to form this durable and easy to care for slab. Some quartz colours that contain aggregate have been known to pop out but it can be repaired. Quartz is the perfect option if you love the look of Calacatta or other expensive marble but don’t love the price or maintenance of marble. Engineered quartz is also available in solid colours for a modern aesthetic or in patterns that resemble granite. Granite is heat and impact resistant. The porosity of granite varies depending on the colour. Lighter colours are more porous but all colours require a sealant so that your new countertop maintains its beauty for the life of your kitchen. Granite is available in a huge range of colours from all over the world to suit all tastes and styles! If you want to go for an option that is a little more budget friendly then you’ll certainly want to consider a laminate countertop. Laminated counter tops can come in patterns that resemble granite, wood or even fabric. They look just as good as other countertop types and are ideal for those who want a top quality finish without paying more than needed. Laminate is a softer surface than quartz or granite so it will be quieter as you prepare your meals. It’s a durable surface but it will show wear and tear over time and cannot be repaired. If you’d prefer a look that resembles a warm and welcoming farmhouse then you may want to opt for a wood countertop. Dark walnut wood tops add a touch of luxury to your kitchen while a maple butcher block style top is more casual. In most cases they come pre-sealed and they are incredibly heat resistant. So there you have it, a quick guide to help pick the countertop that’s right for you! If you’re thinking of a kitchen or bathroom renovation, get in touch with us today and we’ll help you build the “kitchen of your dreams”!